Just days after the NYSC Director General issued a warning about dress codes, some members of the public have got in trouble for seemingly doing the opposite, and apparently taking too much of a liking to the NYSC uniform. 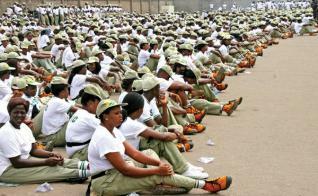 Over 80 impostors allegedly masquerading as members of the National Youth Service Corps (NYSC) scheme were on Wednesday paraded by authorities in Abuja. Ade Abolurin, the Commandant General of the Nigeria Security and Civil Defence Corps (NSCDC), revealed that the suspects were rounded up at a fake ‘orientation camp’ in Nassarawa State. The aims of the suspects were not immediately known, but it was suggested that they were using the NYSC scheme as means of extortion from innocent Nigerians as well as to receive benefits for NYSC members. The suspects have also reportedly been slammed with one year jail sentences, with the option of paying a N21,000 fine after they had pleaded guilty to a three-count charge of criminal conspiracy, forgery and impersonation. The presiding judge, Mr Ali Chongda, said that he had tempered justice with mercy because of the pleas of the defence lawyers and because the accused persons were first offenders. He however ordered that two of the accused persons, Matthew Okey and Chinedu Ebubechukwu, the alleged masterminds who had pleaded not guilty, be remanded in prison custody until March 29 for further hearing of their case. The NSCDC also admitted there are several thousands of fake NYSC members parading themselves throughout the country illegally.